One of my culinary discoveries when I married my husband was that it is more or less unheard of to make a vegetable gazpacho without bread crumbs. 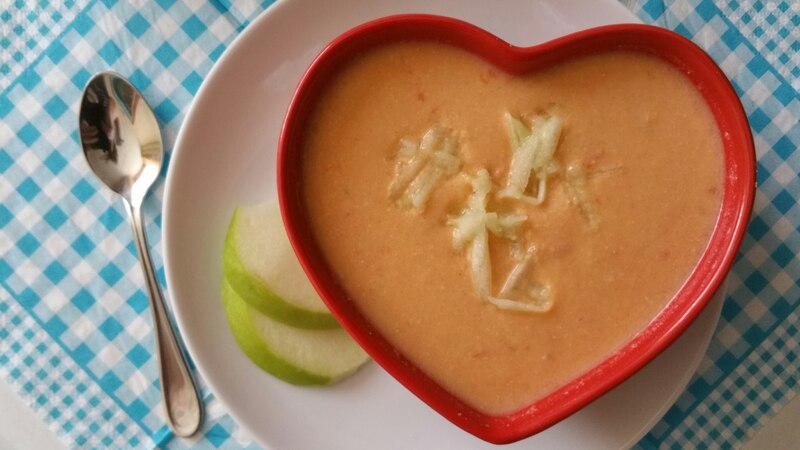 This is why gazpacho is quite a filling appetizer. Since the summer is arriving sooner rather than later these days, I am quite interested in variations on gazpacho. This one includes green apple and I really like it. The recipe says it serves 4 but seriously, it could serve six! Put the olive oil and vinegar in the blender and add the bread crumbs. Add the tomatoes, green pepper, garlic, cucumber and apple. Add the water and salt and blend until you have a fine consistency. If it is too thick, add more water or a touch more vinegar! You may want to add more salt or vinegar according ttaste. Or even more garlic. You decide! Put the mixture in a large container. Cover it and let it refrigerate for at least an hour. The colder it is, the better! People often add an ice cube to their gazpacho too! If it is too thick, add a touch of water. Serve garnished with grated green apple on the top and some sliced apples.